Special Olympics Illinois has been fortunate to experience 15+ years of consistent growth in athlete participation, volunteer and donor contributions and overall community engagement. Over the past few years, we have evaluated our organizational structure, how we have aligned our departments and personnel and provided services to our constituents. It has become apparent that changes must be made to sustain growth and support the organization for the next 10 to 12 years. We have committed to a new organizational structure that fosters a specialized, collaborative workforce, streamlines departments and focuses on programming at the local level. We have realigned our Development department, established a Marketing & Communications department, streamlined Finance & Administration and created a single Program Services department by combining the former Area Management and Sports Training & Competition groups. Externally, the biggest changes will be seen in Program Services. 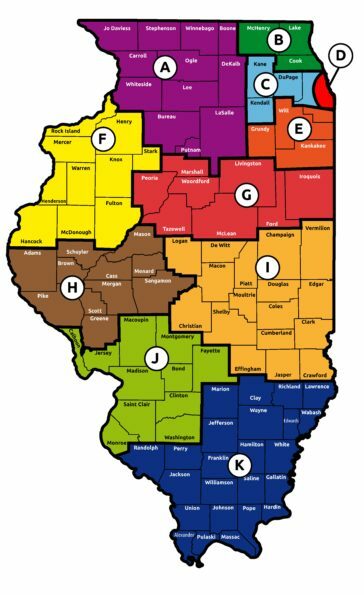 Special Olympics Illinois has consolidated from 18 local Area Programs to 11 Regions and current employees have realigned to roles within those regions. They will be able to focus their job away from a “Jack of all Trades” scenario where they were expected to run competitions, recruit athletes and volunteers, and raise funds and in-kind donations. The new region structure, that has undergone beta testing in parts of the state throughout 2017, will go in to full effect on January 1 of 2018. It will provide opportunities for more personnel resources to serve each Region therefore taking away the reliance on a “Jack of all Trades” approach. By creating specialized job opportunities, the team in each region will be able to dedicate more time and effort to Reach More Athletes, Improve the Athlete Experience and Raise More Resources. Build a solid foundation upon which Special Olympics Illinois can sustain growth for the next 10 – 12 years. Combine the previous Sports Training & Competition and Area Management Departments into a single group, Program Services, building a consistent experience from local to state events with a united vision of quality. Put more resources and personnel in Program Services where they can best support our agencies at the local level. Promote an improved athlete experience, encourage more athlete participation and ultimately drive local relationship building to bring in more resources to sustain and drive growth rather than react to it. Bolster the need to increase revenues in order to support natural and targeted growth through dedicated development roles in the regions. Focus positions to align roles and responsibilities with skill sets for more success in outcomes and expectations regarding serving athletes, families, coaches, volunteers and donors. Give regions the flexibility to cater the program to the needs of that particular region and to react more quickly and effectively for all of its constituents.